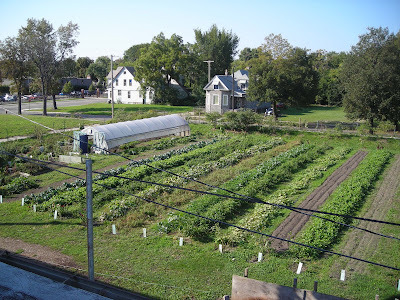 Hantz Farm is an intriguing, if somewhat troubling, proposal for farming urban Detroit. Local millionaire financier John Hantz has proposed purchasing rights to 70 acres of land in Detroit in order to establish a for-profit urban farm on a scale as yet untried in the U.S. The project is marketed with promises of “green” jobs, a restored tax base, removal of urban blight, tourism opportunities and a local supply of fresh produce. The cost of the project is estimated at $30 million and includes demolition of existing structures and soil remediation. 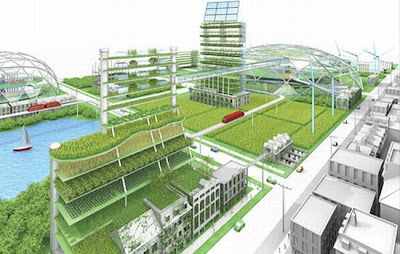 The project would certainly be the largest urban farm in the U.S. and the vision of transforming the former industrial city into a cutting-edge, urban-agriculture experiment is promising in many ways. As a prototype, issues of adjacencies, threshold and operations will be tested at an ambitious scale. If successful, one can imagine that it will be held up as a case study for scores of projects in other cities. Even more interesting is the idea of a new form of urban tourism, where visitors come not to see works of art or towering skyscrapers but to wander the row crops; and do not take home museum souvenirs, but apples, preserves and relishes produced in a most unusual terroir. Will the farm enable bed-and-breakfast inns, prepared good co-ops and gourmet restaurants to flourish? Could Detroit become in time a more novel, hipper Napa Valley? Does it want to? Large land purchases by a single owner in urban areas are always unsettling. Great cities are defined by diversity. While Hantz denies that any landgrab is taking place, some local groups have opposed the proposition on these grounds. Certainly it would be a more comfortable proposition if Hantz Farm had simply leased the land. Also unsettling is their refusal to consider organic farming. Matt Allen, the Senior VP of Hantz Farm states that "organic is out for the moment. It takes 3 years to get certified and so we are going to focus on conventional ag[riculture] methods." Of course, one does not need to be certified organic to practice organic. Beyond the environmental impacts of farming conventionally, it seems shortsighted for the city to allow farm chemicals in an urban area where neighbors, including children, will be exposed. Further, use of such chemicals by workers calls into question how green the jobs really will be. Finally, if Hantz Farm is too impatient to wait three years to become certified, how long will they be willing to wait to recoup their $30 million investment? At nearly $450,000 per acre, Hantz Farms has an astonishing start up cost. Compare that cost with the 2009 average value of farm land in the U.S. of $2,100 per acre. Even accounting for capital costs, labor, seed, equipment and other business expenses, the investment still suggests that Hantz Farm must not be in it for the profits alone. Hantz’s proposal is not the only ambitious ag-focused project in Detroit. New York City activist Majora Carter, best know for the South Bronx Greenway project, is at work on Mo’Green Town, an initiative to create a worker owned cooperative of existing small growers in Detroit. For urban agriculture, Detroit is breaking ground in many interesting ways.